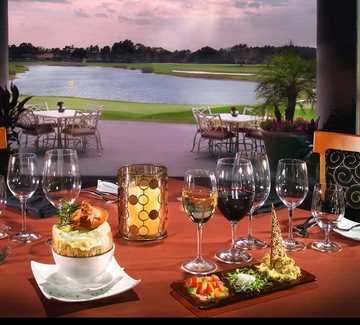 Nine18 Restaurant, formerly known as Black Swan, overlooks the North/South Course at the Villas at Grand Cypress. Opened in 2007, it has quickly become a popular staple of Orlando's dining scene for both locals and visitors. The menu at this dinner-only restaurant has a unique menu offering everything from potato-crusted Chilean sea bass topped with grilled pineapple butter to a roasted rack of lamb served with a tomato mint couscous.